The Regiment of Canadian Guards joined the ranks of the Canadian Army on 16 October 1953, amid a fair measure of reluctant acceptance by existing regiments. The Canadian Guards (Cdn Gds) also faced opposition from the press, lead by the Ottawa Journal which published a number of controversial articles attacking Lt-General Guy Simonds, Chief of the General Staff. It was Simonds who conceived the idea of a Guards regiment and who was its major champion. 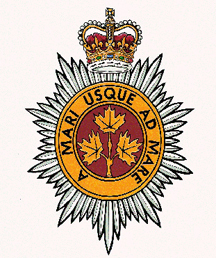 Cap badge of the Regiment of Canadian Guards. The Queen was instrumental in the design of this badge. The regiment consisted of four battalions and a depot. The battalions were previously the 3rd Bn, The Royal Canadian Regiment (1st Bn Cdn Gds), 3rd Bn, Princess Patricia’s Canadian Light Infantry (2nd Bn Cdn Gds), 1st Canadian Infantry Battalion (3rd Bn Cdn Gds), and 2nd Canadian Infantry Battalion (4th Bn Cdn Gds). These latter battalions were created for the 27th Canadian Infantry Brigade and were themselves created from a number of Militia regiments for service in Germany. The composition of the Cdn Gds was truly national and, unlike other Infantry regiments which were limited to specific territories, were allowed to recruit across Canada. In keeping with the regimental establishments of the day, five ‘bands’ were authorized; a military band for the Regiment, fife and drum bands for the 1st and 3rd battalions, and pipe bands for the 2nd and 4th battalions. Following the stated desire of Her Majesty, Queen Elizabeth II, the Cdn Gds were to follow closely the uniform worn by the (UK) Brigade of Guards. In keeping with this principle the Minister of National Defence requested, through the Governor-General, permission from the Palace for the pipers to adopt the Highland uniform as worn by the Scots Guards, including the Sovereign’s Royal Stuart tartan. If Her Majesty grants permission for the adoption of this distinctive Highland dress, which includes the Sovereign’s personal tartan, by the pipers of the Canadian Guards, this high honour will be a source of pride to the Regiment and will greatly enhance its prestige. 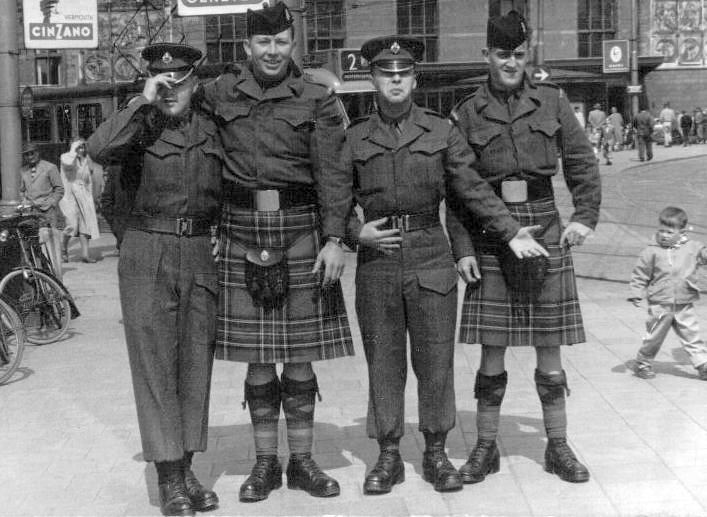 Permission to adopt the uniform, including the Royal Stuart tartan, was given in December 1954. At the same time, the Queen approved a drawing of the bonnet badge to be worn by pipers on the feather bonnet, at the base of the red and white feather plume. 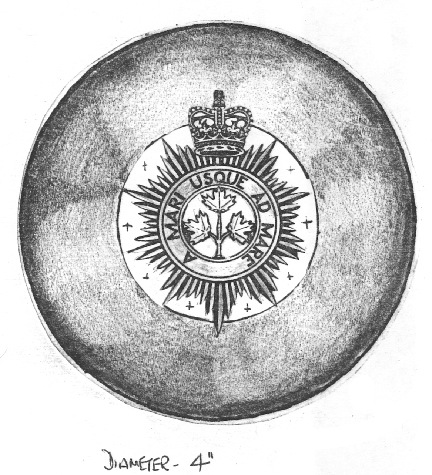 This badge, drawn in April 1954, featured the Cdn Gds cap badge in a white metal buckled belt (annulus) upon which was the regiment’s name. The dimensions were two inches high (to the tip of the buckle) and 2 3/16 inches wide. An undated photo of a piper. His sporran cantle displays a badge as does his buckle while the remainder of his accoutrements are plain. 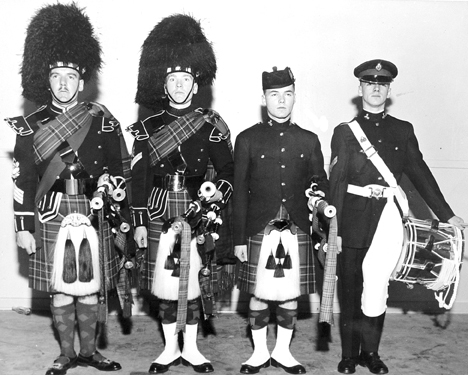 In addition to the uniform and bonnet badge, a number of other ancillary items were required in order to complete the uniform for pipers. These included kilt pins, plaid brooch, belt buckle, sporran badges, and cross-belt fittings. Wasting little time, by December 1955 Army Headquarters (AHQ) had drawings prepared for all of these items and submitted them to the Cdn Gds so that the regiment could obtain samples. These were to be provided at no expense to the public or from the grant provided for bands. Proposed belt buckle. The size was fond too mall to properly cover the gap between the doublet and the kilt and was made larger in 1959. What action was actually taken by the regiment and if the items they obtained were even close to the suggested pattern is unknown although, in 1959 the regiment proposed changes to some designs, specifically; that the bonnet badge be re-sized to 2 1/2 inches in diameter (exclusive of the buckle tip), the pipers buckle be made four inches wide and three inches high, and the buckle tip for the cross-belt be semi-circular instead of circular. 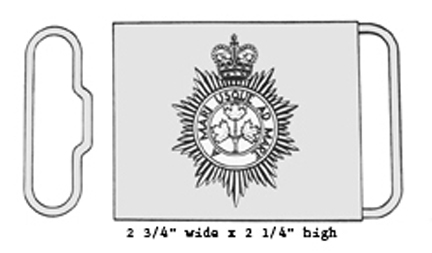 Drawing of the proposed badge to be worn on the feather bonnet by pipers, as approved by the Queen. While the AHQ supplied drawings show a very plain plaid brooch at least one firm proposed a regimental pattern. 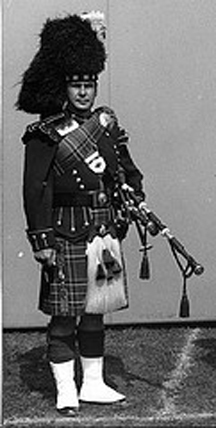 In late 1959 the London firm of Henry Potter, supplier of drums to the regiment, provided a drawing of a four-inch piper’s plaid brooch with the regimental badge centered. However, there is no evidence that these were ever purchased. Brooch pin design proposed by Henry Potter Ltd., of London, the firm that supplied instruments to the bands, including the emblazoned regimental drums. The design does not appear to have been adopted. Some of the changes were straight forward and approval from AHQ was routine provided some basic design criteria were met and procurement policy respected. However, changing the bonnet badge was problematic as the design was specifically approved by Her Majesty. The regiment was advised that the size could be altered but only if the entire badge were re-sized proportionally. 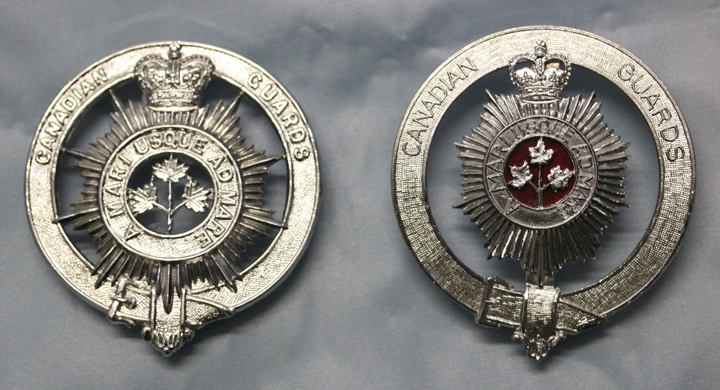 In other words, the buckle could not be made larger while retaining the same size badge. The regiment agreed to this condition. In spite of the drawings supplied to the regiment photographic evidence suggests that they obtained buckles and cross-belt fittings that were of more elaborate design and, for junior ranks, plain (no badge) belt buckles although photographs dating from the mid-1960s show the larger belt buckle embellished with the regimental badge. 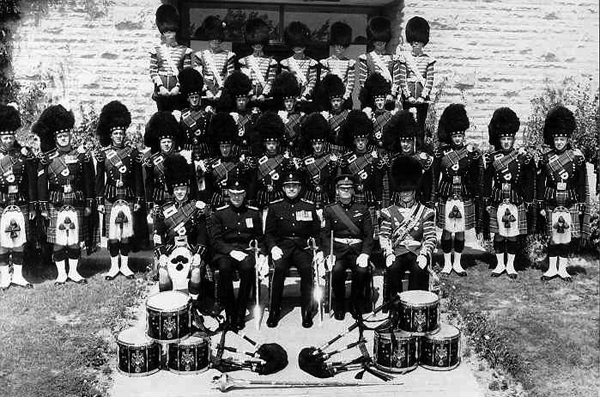 Pipes and Drums of the 2nd Battalion, The Regiment of Canadian Guards, May 1965, at Camp Petawawa. Here, the large buckles exhibit the regimental badge. As is customary in Highland dress, the regiment obtained both hair sporrans for full dress and leather sporrans for wear with battle dress. Most photographs of the former lack the badge on the cantle although it is shown worn on the leather sporran along with four leather tassels – emulating the four black ‘tails’ worn over the white hair sporran. Army Headquarters drawing of the suggested cantle. The whole item, as with other badges and distinctions, were to be of polished white metal. The cantles do not appear to have badges and the brooch buckles are plain. Note the badged leather sporrans which also include four leather tassels. The waist belt buckles are unadorned. Another key item of dress for the bands was the Baldric (var. 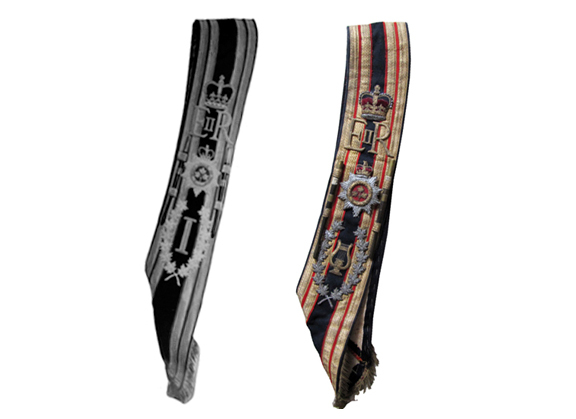 Baldrick) – the highly decorated sash worn by Drum-Majors. 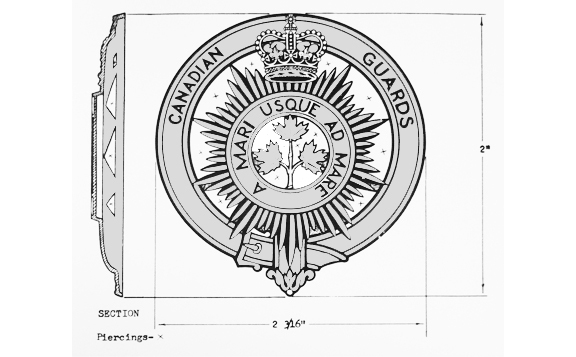 A standard design used by all Line Infantry regiments, with insignia specific to the Cdn Gds, was adopted. Each of the four battalions’ Baldric was identical with the sole exception of the battalion numeral. For the Cdn Gds depot, a lyre was substituted for this numeral. The author wishes to acknowledge valuable documents provided by Ken Joyce and Dr. James Boulton. Regrettably, requests for information to the Canadian Guards Museum at Garrison Petawawa remain unanswered. You can rate this article by clicking on the stars, below. You may also leave comments.